Mercedes-Benz E230 vol. 2, charcoal powered - Charcoal Gasification - Drive On Wood! A work accident put me down for a few days so this is a exelent oppertunity to do some detailed research and planing before the actual build. Refreshing the memory in the meantime. So, first, let me type down what l already have. The engine is 2.3l, 134hp slow turning multi point injected. No adjustible dist, only way to advance timeing is shorting a resistor, wich gives l think 6° advance. I have a crude system installed, gas cooler, basic manual air/gas flaps, cold gas cyclonic cleaners and all the pipeline. Now, for the conversion. The char gasifier will be mounted in the trunk. Or shuld l say the hopper as the actual “hearth” will protrude trugh the trunk floor in what was before a mufler compartment. I wuld like to fit the hopper in the 90l insulated aluminium box l had made for the wood gqsifier so thatd set. The affective volume of engine grade charcoal shuld be at about 60-70l, wich translates to about 12kg of premium oak charcoal and a max range of about 90-100km. Wich is, by the way, more thain useing bulky wood chunks as l did now. Now for the gasifier design. Most likely, its goeing to be a Källe type. It has some features l like and l wuld like anyone who has any experiances with such a device to chim in. Allso, l have a question on exhaust tempered char gas composition. My main question is is it compatible with a membrane vacuum automixer as l plan to install one later on. Right now l havent got much info, exept of what the nozzle material was in the day and the rough % of exhaust gas neaded for nor melting it. 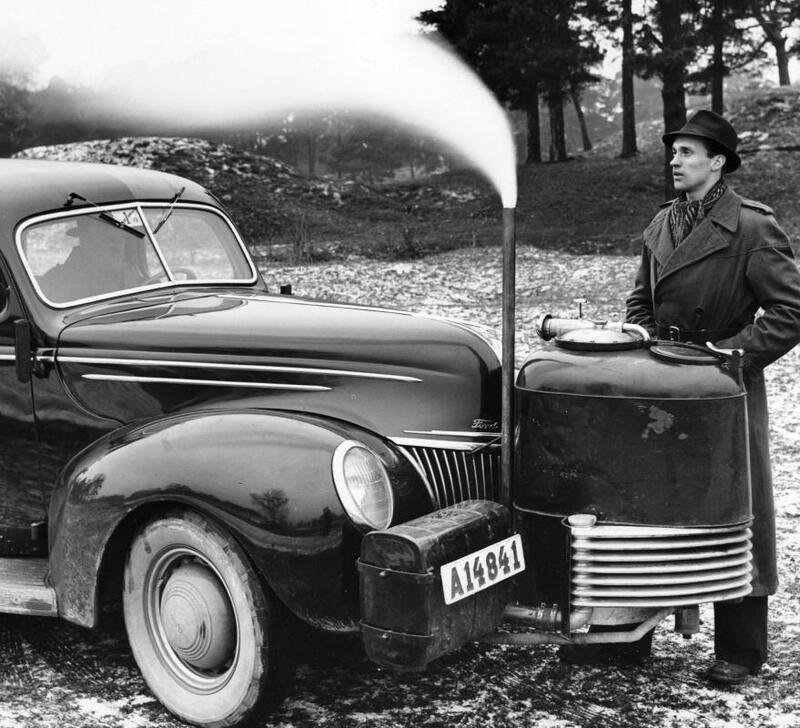 My first vehicle gasifier was a kalle type. It did not have a moveable nozzle. It was a small (20 liter). It produced good gas, but I could only drive 10 miles before the gas became too hot from exposed reduction zone. I only used EGR, no water. My stainless steel nozzle eroded from catastrophic oxidation so i added a ceramic TIG nozzle. The stainless steel screen held up well. I have too little experience to give advice, but I am very excited to learn from you. The dark side takes another victim. I realise now much of the work you did on the MB was not in vain, even though the actual wood gasifier didn’t work out. Looking forward to seeing the progress. Bruce, have you got any photos? How long did your TIG nozzle hold up? I like the Kalle design for its legendairy advantiges but its the nozzle that concerns me. Anyone who has ever looked trugh a chargas nozzle knows its too hot iside eaven for the devil. At Kalle desigh, the nozzle takes s direct beating. As you know, l am a big fan nassive updraft nozzles. I might try to incorporate them to work as a moveable kalle nozzle. premium oak charcoal and a max range of about 90-100km. Wich is, by the way, more thain useing bulky wood chunks as l did now. 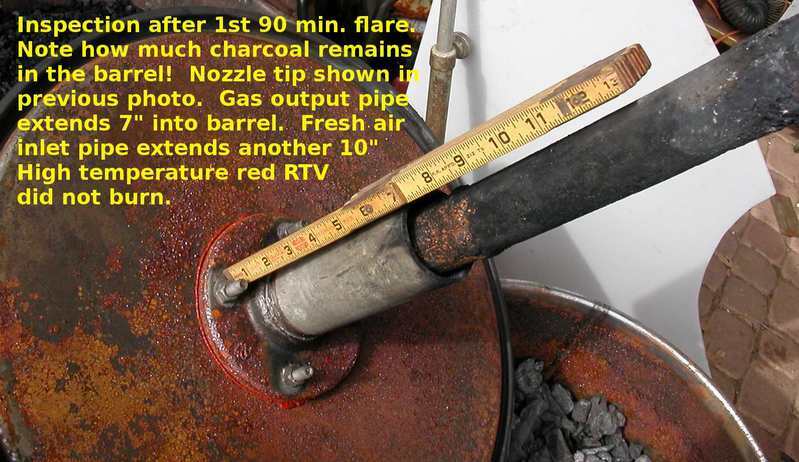 Thanks Kristijan, I have always wondered about the wood vs. charcoal ratio, charcoal having no tar and less H2O. Wood size larger with voids in the hopper, charcoal smaller less voids, less weight but half the energy. Weight of the charcoal gasifier less then wood gasifier. This all adds up to how far you can go with the same size hopper for both gasifier units. The only disadvantage I can see is you have to haul all your fuel with you for the round trip. No making fuel out on the road. But it is lighter and more compact per mile, you can haul more of it in pounds per miles. Which is a plus. Running down the road completely sheath is a big plus were it is needed in a car. I also like the new term being used, for a charcoal Gasification now. It is a " hydrogen production reactor with carbon catalyst fuel cell for producing fuel to run your engine on". It sounds so greenish/cleanish, just the right wording, right? For all the highly sensitive and easily offended poeple we have in our world to day. I just have to say to them … Get A Grip on your life. My Lord have mercy on them all. Thanks again, for your new thread. We will all be following your progress on this new build. Tom, l am with you on simplicity! However, there are things to concider here, mainly the hopper is in the trunk. Althugh l am a fan of simple updraft char gasifiers, such as Don and Koen and most other use, it has shown to be a wrong design for insulated hoppers. I learned that on my Seat. The thing is althugh chargas contains wery litle exess heat energy that is usualy radiated out the hopper wall due to internao gas circulation, resaulting in cool outgoeing gas, if the hopper is insulated, that is not the case! The litle exess heat builds and builds and at a point it is to hot for safe operation. Adding fuel does not help so with my seat, l only had 15 miles range, then l neaded it all to cool for a few hours, then l culd drive for 15miles again. Needless to say, l cant be satisfied for 15 mile range on this car, so, the gas needs to be driven out hot, stright as it comes from the reduction zone and not alowing it to heat the whole bed/hopper. This is what a Kalle gasifier does. it recirculates soot/dust to the reactor. since you can move the nozzle up and down, you can light and “crush” the glowing ember trugh the heart with the nozzle. This is supposed to sorten startup time to just 30s! the moveable nozzles job is to smothen the different gas demands. In short, it reverses the hearts oxy and redox zone when you want to accelerate, wich is supposed to make have no hasitation effect to gas quality. the motion of the nozzle scrapes the grate constantly, no plugging can ever occur. -and lastly, althuhg not mentioned in literature, l think it shuld run fine without screening the dust out of the chat. This is a major factor in wood fuel economy. Bob, well sayd. If l had a penny every time some smartass starts preeching me how l shuld build a gasifier he only knew existed a minute ago, l wuld be a rich man. I like my current charcoal gasifier design but for my small utility vehicles I am planning to design a gasifier to match the machine it is going on. In my case the gasifier will be compromised to match the machine. But, overall the total machine will work better, I hope. That is what is so nice about charcoal. Your not stuck with one or two designs in your tool box. I’ve been a reading guest for a while and since I’m not able to build something by my own at the moment I wanted to remain calm. But this is highly interesting, so I would like to contribute something. As mentioned above, this is only theoretical knowledge, not practical experience (so far, I hope). I searched the web, but except from the swedisch book about gengas (can be found here in the library section and is very useful about the pros and cons of this gasifier), I found nearly no additional information. A problem might be if you want to add both exhaust gases (necessary for the “wind sieve”) and steam to keep the temperatures in the small reaction zone in the right range. I’m sure you can build one, but this would require a lot of experimenting. The short start up time can also be acchieved with an other design if you have some freshly broken small charcoal particles. If you want to drive soon on charcoal and use as much as possible of you gasifier, why not try the Mako S design (swedish gengas book, page 108). It is a relatively simple charcoal-downdraft gasifier. Advantages as listed in the book: Simple and lightweight, required little maintenace, worked with fuel size from dust to 60 mm (best 20-40 mm) and is insensitive to inferior quality charcoal. So maybe you don’t need to sieve your coal as well here. I would add steam or exhaust gases and mysbe a hearth insulation, which was not in the original design. 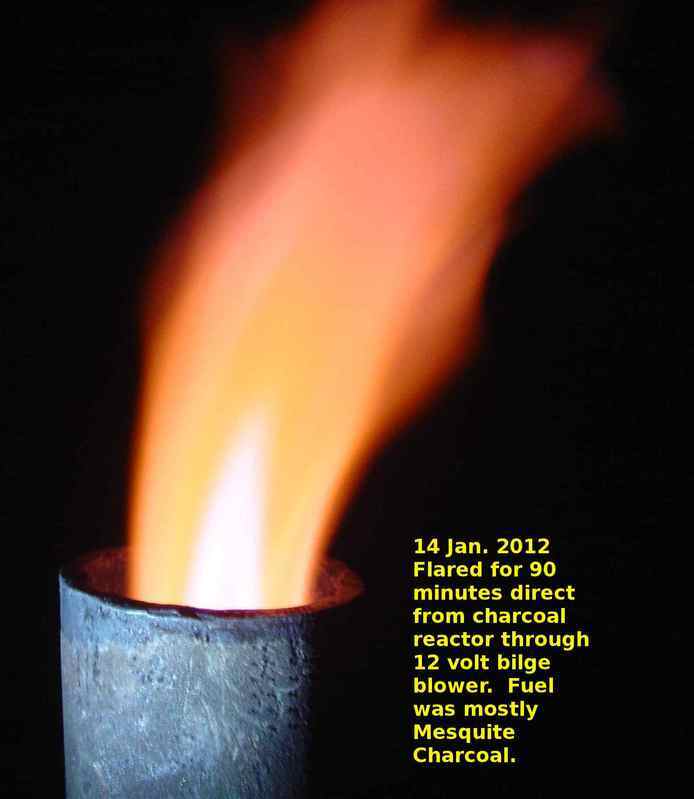 This was a long post and nothing is proven by myself, just read everything I could find about gasification. Hope that helped a bit. As the Mako is downdraft, the hopper should not get as hot as an updraft design. One sure sign, that the Källe has it’s disadvantages is that despite it’s advantages, it could not replace all the simpler designs. And a last picture from the inside. Sorry fro the many posts, but I’m just allowed to add one photo. Wellcome to DOW, we, and expecialy me, appreciate any input! I see you have lots of knowlidge. Hard to belive its only theoretical, you did your research well! I am with you on useing exhaust and steam together. 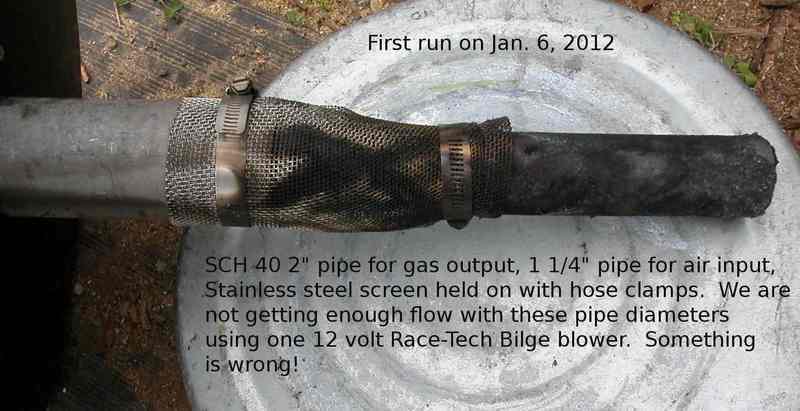 Problem is steam needs a high temp to crack completely, ehile CO2 isnt so demanding. This is my major concern. Information about the Kalle are rare yes. Pictures eaven more so. The original nozzle was not ordinery stainess steel, but if l remember right, kenthal. This aloy has a high aluminium content, meaning as it oxidised in the first few runs, the metal got plated with a thin lair of aluminium oxide, wich acts like cheramics, preventing any further erosion. Ofcorse, geting it is a nother story. But like you said, shuld be far less picky for fuel qualuty. This video is most interasting, hat off for the maker, he showed the design realy well. I am planing to copy this designs filter. The green Kalle pic shows some of its features, but not all. The starting knob is seen well on top, allso the rough size of the membrane. l will most likely go in the direction you mentioned, updraft with lower gas output. A simplified Kalle version in a way. l will take the wind sieve from Kalle, and might eaven experiment with two plane air nozzles to come near its performance. But main advantige is l can build the shell and put in a simple nozzle and drive, while adding the gadgeds later. Well, there is some knowledge with metalworking, old cars and motorcycles, but not specifically gasification. The problem is that at the moment, that I live in the city in a small apartment. No workshop around. So I’m limited to read everything within reach, and I’ve done that excessively. But building my own gasifier is on the bucket list, just a question of time. You’re right about the nozzle made of Kanthal. But I would guess a very high grade type of stainless steel might work as well. 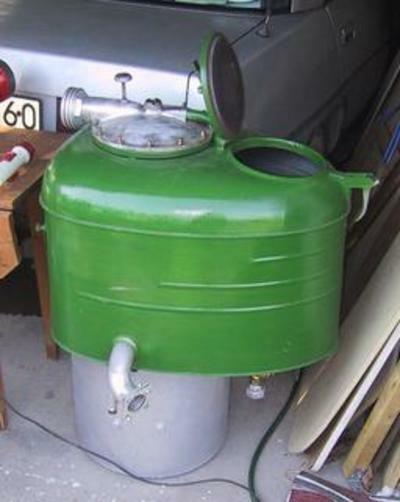 One of the types Vesa Mikkonen recomends for his stainless gasifiers. To the problems with the downdraft you mentioned: That sounds plausible. I can’t say anything about limited output, but the pressure drop and constipation tendency could be lowered with a good grate design. I think of a gap between hearth an grate just like the Imbert design and a good shaker. The thing that puts me towards downdraft is the ability to deal with leftover traces of tar in poor quality charcoal, maybe an emergency refill with a bag of BBQ charcoal or something like that. With high quality car-charcoal, an updraft system will most probably give better power. I really like the forge-type hearth as built by Don Mannes or Gary Gilmore and would combine it with a lower gas output, thus avoiding to heat up all the hopper. A wiend-sieve could be useful without a Källe-nozzle, but I guess since you don’t have the grinding action of the moveable grate there is not that much fine particles. Anyway, if there are any, it is for sure clever to blast them directly in the reaction zone. I’m curious how you are building this one and I’m inhaling every information that is brought together here. Regards and hope you are well again after your work accident. is l can build the shell and put in a simple nozzle and drive, while adding the gadgeds later. About seven years ago, Martin Payne and I built a simplified Kalle, which is still sitting in my shop, waiting for nozzle improvements. Here are two photos of what we did in 2011-2012 Winter. In case l use unsifted charcoal, the fines quantity shuld be substantial. About 20% of charcoal ends up as dust and fines and its a pity to waste. You are right about auxilary bbq fuel use. I have done it before. This is a usefull ability. Well the work accident hurt my right eye, so welding and cuting is most likely a bad idea right now, but l am planing to buy the metal for the gasifier today, maybee slowly start buildong in the next few days. Thanks for your concern! Thank you Ray! Any help is wery wellcome! Did you use any egr/water drip? Kristijan, I will be praying that your right eye will heal 100% or better than it was before the accident. In Jesus Name. Glad you are using your down time well. Watching intently on your build. 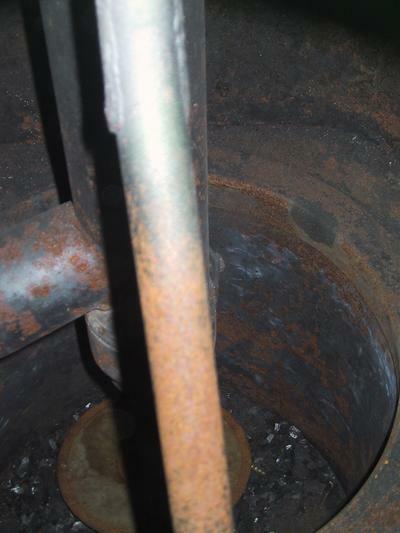 This was the first gasifier, and we flared and flared. Gary’s video showed him dropping dog food, pieces of plastic, oil soaked wood, and all sorts of stuff into the unit, and we did the same. We lit the charcoal with a piece of rope saturated with gunpowder, dropped down the inlet. Our flare was not what we were expecting. It was much too yellow, and we were chasing the “Magic Blue” color. 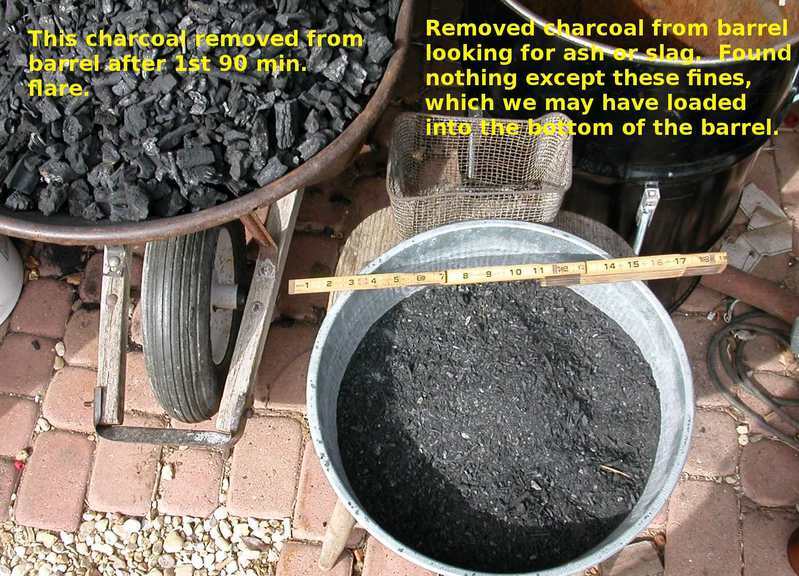 People offered opinions that we were using charcoal made from land that used to be under the ocean (high in Calcium and Salts), or that we had too many dead possums in the charcoal making barrel, or that some sort of other salts were being picked up by our charcoal. In retrospect, the charcoal had way too many large pieces, included too many fines, and may have had even contained raw wood. Later, we stopped flaring, added a GEK Cyclone, and a Gilmore type cyclone with charcoal and foam filtering, but switched the reactor to a Simple-Fire, and got nice blue/purple flares, and were bold enough to run engines. We never ran the output from the Kalle to any engines, thinking it wasn’t good enough. I’m a fanatic about eye and hearing protection. There are safety glass, goggles, and shooting ear muffs all over my shop. I did not protect my skin enough, so I have had 23 surgeries on head, ears, neck, arms, shoulders, and the back to remove skin cancer. (Not a good way to lose weight!) Also, I should have been using sunglasses more than I did. I’m a fanatic about eye and hearing protection. There are safety glass, goggles, and shooting ear muffs all over my shop. Yeah, most of the men (and a few women) in my family have been mechanics and welders for 7 generations now. When I was first married, I almost caused a family feud when I told my dad and grandparents and great grandparents that I would not train my boys for that kind of work because of how broken and blind and weak they all looked all the time from breathing welding fumes, and digging metal fragments out of their eyes, and laying in grease all day long, and soaking themselves with brake cleaner and ether, etc.